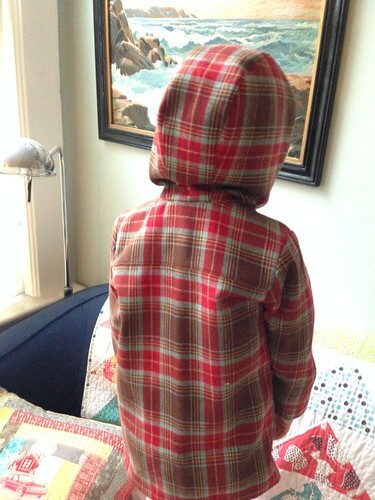 Last summer I was at the Pendleton Mill store and scored a 5 yard cut of some red/tan/light blue plaid wool on closeout. I don’t remember what I paid, other than that it was ridiculously cheap. I knew that I wanted to use it for a coat for Kit, as well as for a couple of other projects. 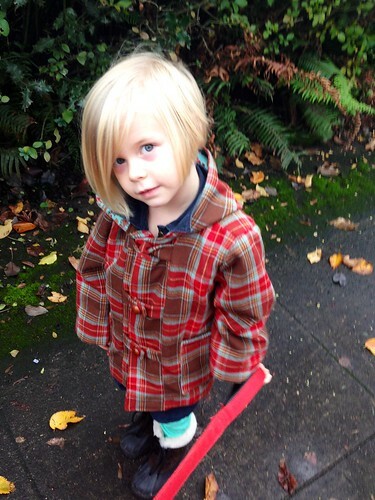 I also found the Oliver + S School Days jacket pattern for $5 on the same trip, and I snapped it up. It was the smaller size (up to 3T) so I had to use it pretty quickly. 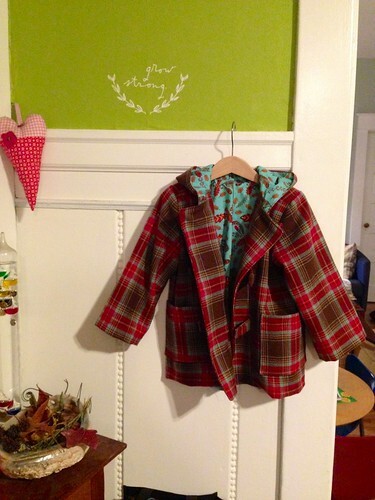 Finally, a few weeks ago, I paired up the jacket and the plaid wool to make my new favorite thing that I have ever made. It’s also Kit’s favorite thing that I have ever made (and she loves everything, sweet girl). She loves this coat so much. I got to tackle all sorts of fun new skills with this jacket. I matched plaids, or purposely offset them. I sewed in a full faced lining. I made lots of buttonholes (okay not a new skill, but still fun). The lining is fabric that my friend gave me when she closed her fabric shop in Seattle. It’s a perfect color match for the jacket. The print is of floral butterflies and oak leaves – just right for a fall coat! The buttons are also from Pendleton. They are woven leather buttons that I bought for $.05 each. Seriously. I bought 50 of them, so expect to see a lot of these buttons on future projects. Overall, I loved working on this coat and would like to make another one for her. I may just have to buy the digital pattern of the bigger sizes if I can’t find someone who wants to destash the paper pattern. It fits her perfectly right now and is the biggest size. On the next one I would add a couple of details, like a locker loop for hanging it on a hook, an inside treasure pocket, and buttoned straps on the cuffs for a more polished look. I just ordered this pattern to make the big people version. 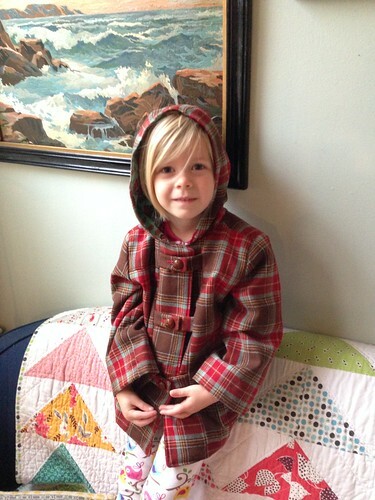 Let’s hope Pendleton has another big sale soon, so I can outfit the whole family in new plaid coats. Hello, my name is Sarah and I’m mad for plaid.